BILLIONAIRE GEORGE SOROS BRINGS HIS NIHILISTIC U.S. FREAK SHOW TO EUROPE…… – The Tundra Tabloids……. It’s all about bringing the system down…..any which way that they can. This is not about ”Black lives”, anymore than feminism is about female rights, it’s all about crushing the existing order, using any societal provocation it can muster. 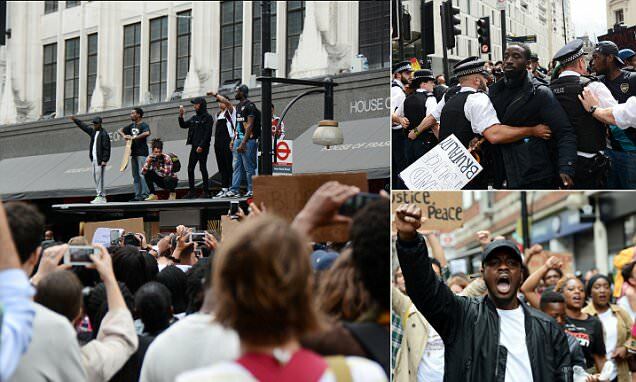 Hundreds of marchers gathered on Oxford Street – the busiest shopping street in Britain -at 10am this morning in the wake of the deaths of Philando Castile and Alton Sterling. Both men died when they were shot by police officers despite appearing to pose no threat. Today’s protest drew hundreds of placard waving campaigners marching to show their solidarity with the dozens of black Americans who have died at the hands of police officers in recent years. The gathered group chanted ‘Hands up, don’t shoot’ and ‘No racist police’ as they moved along Oxford Street to the U.S. Embassy on Grosvenor Square. Previous Post Previous Post CARBON FOOTPRINT TAKES ITS TOLL……. Next Post Next Post SHOEBAT: SWISS TELL MUSLIMS IF YOU REJECT OUR CULTURE WE’LL REJECT YOUR APPLICATION FOR CITIZENSHIP…….